11 people have been here. Florida is a state of the United States. It is located in the Southeastern United States, bordering Alabama to the northwest and Georgia to the north. Much of the state's land mass is a large peninsula with the Gulf of Mexico to the west, the Atlantic Ocean to the east and the Caribbean to the south. Florida was admitted as the 27th U.S. state in 1845, after a three hundred year period of European colonization. The Wizarding World of Harry Potter forms part of Universal Parks and Resorts' Islands of Adventure theme park in Orlando, Florida. It is one of seven themed areas within the park. The Wizarding World of Harry Potter was officially announced on May 31, 2007, and after a two and a half year construction period, the area officially opened to the public on June 18, 2010. The Walt Disney World Resort, sometimes shortened to Walt Disney World or Disney World, is the world's largest and most visited recreational resort, covering a 30,080-acre (47.00 sq mi; 121.7 km) area just southwest of Orlando, Florida, USA and encompassing four theme parks, two water parks, 23 on-site themed resort hotels (excluding 8 that are on-site, but not owned by the Walt Disney Company), including a campground, two health spas and fitness centers, and other recreational venues and entertainment. Miami is a major city located on the Atlantic coast in southeastern Florida and the county seat of Miami-Dade County, the most populous county in Florida, and the eighth-most populous county in the United States, with a population of 2,500,625. The 42nd largest city in the United States, with a population of 433,136, it is the principal, central and most populous city of the South Florida metropolitan area. The John F. Kennedy Space Center (KSC) is the U.S. government installation that manages and operates America's astronaut launch facilities. Serving as the base for the country's three space shuttles, the NASA field center also conducts unmanned civilian launches from adjacent Cape Canaveral Air Force Station (operated by the 45th Space Wing). KSC has been the launch site for every U.S. human space flight since December 1968. The Wizarding World of Harry Potter is a themed area spanning two theme parks—Islands of Adventure and Universal Studios Florida—at the Universal Orlando Resort in Orlando, Florida. 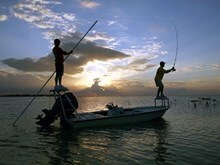 Ever since legends like Stu Apte and baseball Hall of Famer Ted Williams started catching big game fish in Florida’s waters on fly rods, the biggest prize here has been the Florida Keys slam—bonefish, permit, tarpon. Each species presents its own challenges and rewards, which makes going for the slam such a rush for veteran saltwater fly anglers. To tick off all three species you will need to exercise a wide range of skills." The “big” in Big Cypress is much more about land and sky than about trees. Most of the preserve’s giant cypress trees were long ago logged out, leaving behind their stunted kin. But few places can match the sense of spacious wilderness (720,000 acres, or 292,000 hectares) and primal pleasure of Big Cypress Swamp when you hike it under its own terms. Which, we submit, is when it’s underwater. That’s right—conventional wisdom may say to stick to the dry season, and that’s fine." 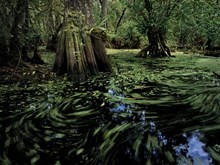 The term “blackwater swamp” gets the mind conjuring reasonable, swamp-related aversions, such as alligators, cottonmouth snakes, carnivorous plants, and getting lost in dark tangles of vegetation. 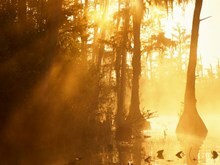 Okefenokee is indeed a swamp of the blackwater variety, but that refers to its tannic tinge. In truth, the water is clear; well-marked canoe trails make getting lost difficult; and much of the swamp is wide-open prairie—more big sky than heart of darkness." 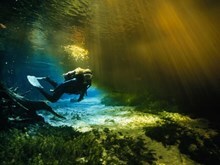 Little known fact: Florida’s best diving isn’t in its saltwater. It’s hidden in the northwestern corner of the state, which is riddled with freshwater springs that flow through mazes of limestone passageways. Few people ever witness the strange sights of these underwater chambers—fossils, sunlight beaming in from holes in the cave ceilings, and even ancient mastodon tusks—because the only way to see it all is by donning a mask and flippers."